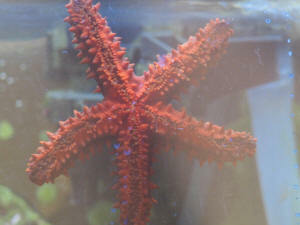 I am trying to identify the species of starfish displayed in the enclosed photo. It was sold to me as a "Hawaiian lace starfish". I cannot find definitive information for that common name, and I have yet to come across a photo of something similar. What is your expert opinion? It looks vaguely like a more "knobby" Linckia, or like a less spiked Gomophia egyptiaca. Now that we have established a likely species, do you have any recommendations for diet of this magnificent star? Google does not yield much assistance, recommending only "live food". The star had no interest in the clam I offered it, but it is actively foraging all over my 100lbs of live rock. I just spoke with the retailer, who had the star in store for 6 months. It thrived in a 70 gallon tank with only live rock. He says that he never once fed the star, but that it subsists off bacterial film in the tank and on the rock. Would you agree with this assertion? That sounds more like the behavior of a Linckia. I would hate to think I'm not providing adequate nutrition for this creature.